The vocal sextet Cinquecento are rapidly becoming one of the most admired early music ensembles recording today. The lithe, clear yet rich and warm tones of the six singers are ideal for the complex polyphony from the 16th-century Hapsburg court which they have made their speciality. This latest release presents the music of Jacobus Vaet, repertoire they began to explore in their first disc for Hyperion (Music for the Court of Maximilian II). Vaet would undoubtedly be among the best-known composers of the sixteenth century had he not died at the age of about thirty-seven. 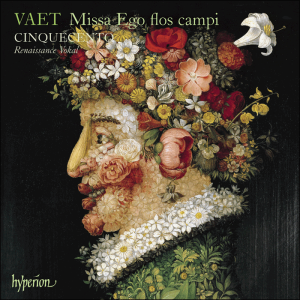 In his short career Vaet produced, among other things, nine settings of the Mass, and his Missa Ego flos campi, a parody Mass on an extraordinary motet by Clemens non Papa (which also appears on the disc), is a notable example of his particular artistry. A fascinating selection of motets demonstrates the composer’s vivid approach to word-setting and imaginative choice of texts.